When people ask my help, it’s often to avoid or to remedy a situation like this one. He had a dream, an idea, for a new business. It was a product and a service. He saw it in its glory. It was part store, part community bustling with transactions. He saw the people coming — they knew they couldnn’t wait for it. that he thought was cool. that was costly, but “worth” it. that was harder to use than he realized. that he didn’t know how to sell. that someone else had already built — better, faster, less expensively. Nothing happened. No one lined us. No bustling community developed. The dream was built and no one lined up. No one has noticed it. Why? He didn’t remember to talk to the people who were supposed to come. Suppose, instead of building that business and offering it to them, we invited the people we want to serve build the business with us? The culture of social media and social networking offer huge opportunities to build a business with a community rather than for them. In the 18th and 19th rural North America, building a barn — the most important structure of farm — required many hands and many skills. Time was often short and funds could be tight. Barn raising was the work of an interdependent community that saw barns as an important part of life. A barn raising used to be a one- or two-day event. Materials were purchased and plans were finished ahead. When the community came able-bodied and quick-minded members could start right in. Barn raisings were lead a barn raiser who with a well-thought plan who was paid to identify and manage crew chiefs, specialists, and volunteers for “pitching in.” New barn raisers were expected to watch before they took up their work. 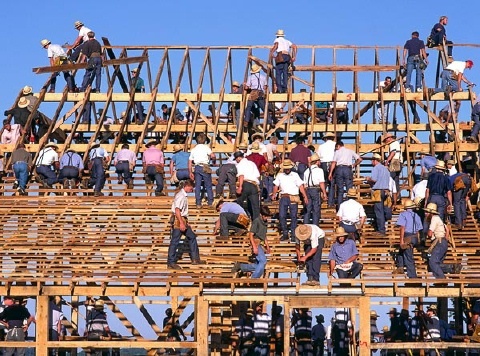 A barn raising is the ultimate community collaboration to complete a common, organized goal. Barn raising a business in the social media culture offers the business and the community members who participate clear benefits. Here’s why your social media business building should be a barn raising. A community needs a plan and organization to build. We can’t fool a community by building parts that don’t work together. We can’t get stuck or be moved to fall in love with our own ideas. Enlisting a barn raiser and crew chiefs keeps your plan organized and on schedule. Ideas and costs get questioned. We all gain skills and relationships from participating in the process. The final business reflects the needs and values of the community that built it. The process provides a product or service has proven its worth by the community support. Barn raising builds the community at the same time that it builds the business that will serve us. Everyone who has participated is invested in its success. Don’t just think … do. Ever been part of a project that worked like a barn raising? What would be the first step in helping some get a social media barn raising started for their business idea? Great insight Liz! I love the barn raising analogy and am surprised it has not been used to describe social media more often…it fits perfectly into that framework. It really just comes down to listening and respect within the SM sphere…it’s just surprising more companies don’t realize this. That’s a great post Liz! Am immediately forwarding it to my new customer and other people that need some more convincing in order to realize the importance of the community. 1. I realize that I need to bring along a team of five other folks I can count on to handle our given task. Wood is heavy. 2. Ask clear questions not only of what our team will do, but how it will fit into the overall scheme of the raising, so as to maximize the remaining sunlight. 3. While staying focused on the assigned task, realize that things seldom go as planned, so keep a flexible attitude and be willing to lend a hand when and where needed. The overall goal is more important than the parts. This is a great article Liz – A community can build, implement and thrive much faster than an individual. There are many opportunities for communities to lead, shape, define and set the standards for social media and how business will be done in this evolving new economy. America needs visionary entrepreneurs like yourself to inspire unity and teamwork that can once again set the standards of how business is done in the world. 5. Bring your own tool belt. Who has fifty hammers? Now *this* is a superbly brilliant article with most excellent insight. A few years after I had started online (1999) I created one of my most spectacular failures by NOT taking into account some key things about my targeted customer base (the main point being they were computer-phobic). Ah well, live and learn. Gathering input from those to whom you want to sell makes brilliant sense….I’m going to mull over this more. Thanks for another great article. I see where this can truly be an amazing experience – building a business as you build a community. It’s beginning to make sense…. If you are building a community you will likely build a nice business. If you have a community they will also be word-of-mouth advertising for you. I just think people overlook this and it is just another characteristic of a failed idea. Great idea, Liz. Ultimately sales come from people… why not see what they want first? I LOVE THAT PICTURE!! So reminds me of my dad losing the old family barn to fire in 1986 but the folks around the community pitched in and raised $9000 to surprise him with and when construction time all hands came a callin’ to help. Me – first step in building social media community? Since I’m still basically blogging only I try to get myself out there, comment and comment some more. Thanks so much for posting this Liz. It was exactly what I needed today. That’s what Brian Clark and Tony Clark did with Teaching Sells in October 2007. (I joined as a charter member and got to learn and watch their process as well). They had fabulous results. I’d like to do a similar thing with the subject of new business startup for solopreneurs. Please talk to me. I’m listening for your input. Yeah, barn raising sort of pulls it all together in the right community sense. But your two words doing it even better … listening and respect. Communities need each other so that we can lead, shape, and set the standards just as you say. Thank you for the comment. You inspire me to keep thinking. And it’s so much more fun when we have folks helping us build and shape our ideas. … I know I’ve been building products for a long, long time. I love that picture too! Wish I’d been part of the event it shows. Sounds like you got to experience something pretty spectacular yourself. Also sounds like you’re on your way to making it happen again. It’s what we all need. We do so much better together.